Amdocs is proud of its relationship with the First Nations Leadership in the communities we serve. 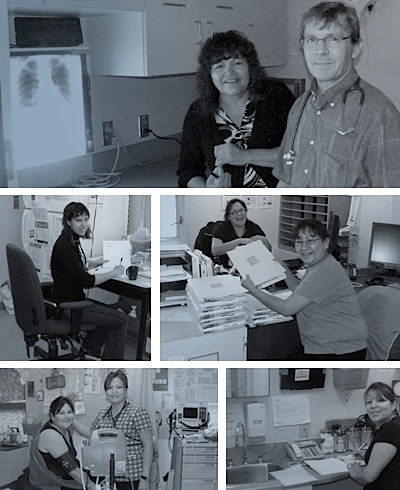 It is through these partnerships that Amdocs is able to achieve one of its goals—to help empower First Nations to enhance their rights as a People to be the recipient of better health care services. • consult patients with chronic disease in the clinic. • consult acute care patients in the daily “walk-in” clinic when staffing allows for such acute care clinics. • are available for on-call emergencies, acute care nurse’s consults and telephone consults. • are also responsible for any serious after hour emergency on-call consultations. • care for chronically ill patients, who find it difficult to come into the nursing station, through the weekly Home Visit Clinic. • work in the weekly Minor Surgery Clinic (lumps & bumps) which prevents the need for specialist referral and saves additional travel and accommodation costs. • deliver telephone on-call services to the designated Northern Stations. A day of work generally consists of eight (8) hours and is normally provided Monday through Friday. Amdocs focuses care on comprehensive healing relationships and wellness care rather than isolated short moments of in-person patient visits. Physicians work within a collaborative practice model where patient files and care is shared amongst physician colleagues, nurses, and other members of a multi professional primary healthcare team.